The use of video and other forms of media (such as audio, images and lecture capture files) has skyrocketed at educational institutions over recent years, and departmental-level media management solutions and streaming video servers are proliferating across campuses in an effort to fulfill this rising demand for campus media. This approach—where there are various separate “content silos” for instructional media, for the library’s video and audio reserves, and for public-access rich media for campus communications, as well as for other groups and departments—ultimately becomes support-intensive due to a lack of consolidation. 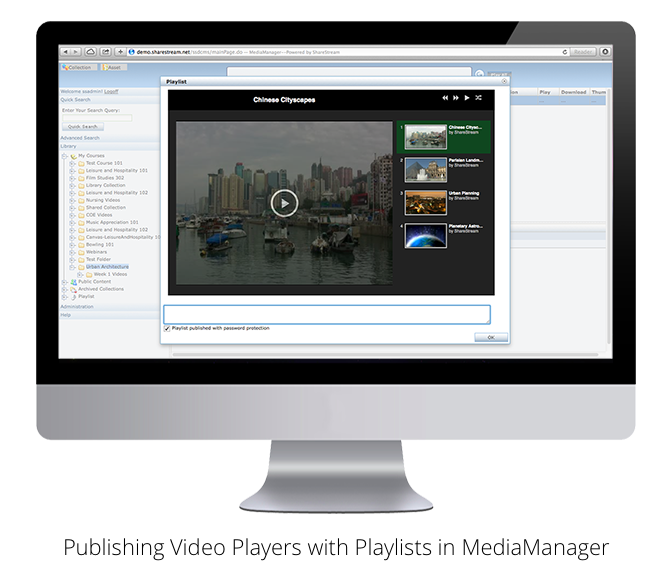 ShareStream’s MediaManager—the video content management system (CMS) component of the ShareStream Video Platform—allows institutions to consolidate “content silos” and departmental-level digital media efforts into a centralized, campus-wide video CMS that is optimized for storing large multimedia files and handling high volumes of concurrent user accesses. This allows ShareStream customers to realize significant economies of scale. MediaManager provides media-project leads with a proven multimedia-management solution for achieving massive-scale media implementations without creating a workflow burden for staff.